Yesterday, I got a very unique experience and opportunity. This year my company gave all of its employees $100. My boss put no limitation on how we used our $100, but she just told us that she hoped we would spend it on the less fortunate. I had been thinking about different ways that I could spend my portion. Ultimately, my coworker, Malcolm (2nd from the right in the picture), and I decided that we would pack together bag lunches and give them to the homeless. We proceeded to buy a bunch of premade sandwiches, P3 protein packs, granola bars, crackers, oranges, bottled water, and put together the bag lunches. After that, we drove towards downtown to an area that Malcolm knew as a homeless hangout. The area that he knew as the hangout turned out to be the Metro Atlanta Task Force for the Homeless shelter. As we approached the homeless hangout I was feeling all sorts of emotions. I don’t really know how to describe the feeling, but I was certainly nervous. We pulled up and there was a large group of people gathered around the back of a U-Haul truck. It turns out the people in the U-Haul truck were handing out winter clothes and blankets. 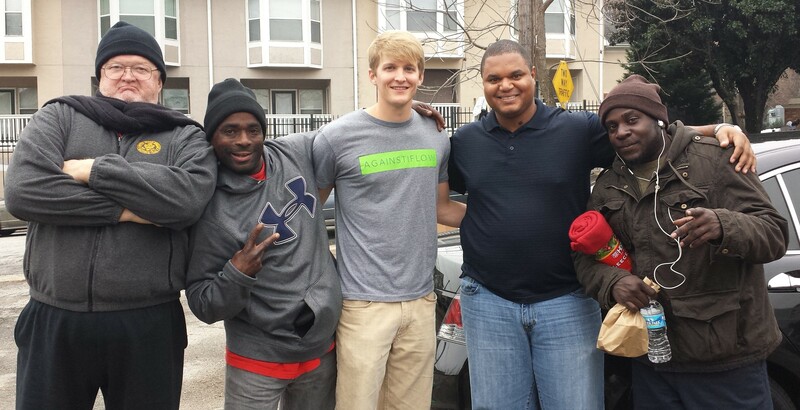 As we were getting out of the car we were greeted by a gentleman named Nate (2nd from the left in the picture). Nate has been living at the shelter for a couple of weeks because he was forced to move out of his apartment due to black mold. He had nowhere else to go so he ended up at the shelter. After explaining to Nate what we were there for he told us to get the lunches out. Before we knew it every single one of our lunches was gone. The lunches were a hit, but we literally could not give away the water. I guess they did not want the water because it added a lot of weight to what they had to walk around with. We ended up having two cases of water leftover so we donated them to the shelter. Before we left Nate gave us a glimpse into his daily life at the shelter and his daily struggles. He said his biggest struggles are getting to and from potential job interviews because he can’t afford the bus fare. Nate also told us that the people that really need help are the women with young children. They have a tough time being able to take care of themselves while also trying to take care of their children. The homeless men can get by with food through donations around the shelter and then go look for work during the day. The women have nowhere to go and no one to take care of their kids. Nate told us that food really was not an issue during the weekends because of group donations, but during the week donations are less consistent and food can be a big struggle at times. Everyone we talked to, including Nate, were extremely thankful for all of the generous donations that they receive, especially during the holiday season. However, what really struck a chord with me was something that Nate told us towards the end of our conversation. Although donations during the holiday season or when it is cold outside are much needed and much appreciated…these people need donations the entire year…not just one or two months. They are fighting to survive everyday and this shelter helps keep them on their feet.